Place the oranges in a small pot and cover with water. Allow to boil for 1-2 hours, checking that there is always enough water in the pot, so that the oranges don’t burn. Once oranges are soft and just falling apart, drain and allow to cool. Puree or mash boiled oranges (set aside puree for later use if you wish). Mix eggs and sugar well. Add orange puree, soy grits and baking powder, then mix all well. Pour mixture into prepared cake tin and sprinkle top with a little extra caster sugar if you wish, prior to baking. Bake at 160C for approx. 40mins - 1 hour, or until golden and soft to touch. Allow cake to cool, remove from tin and dust with icing sugar. 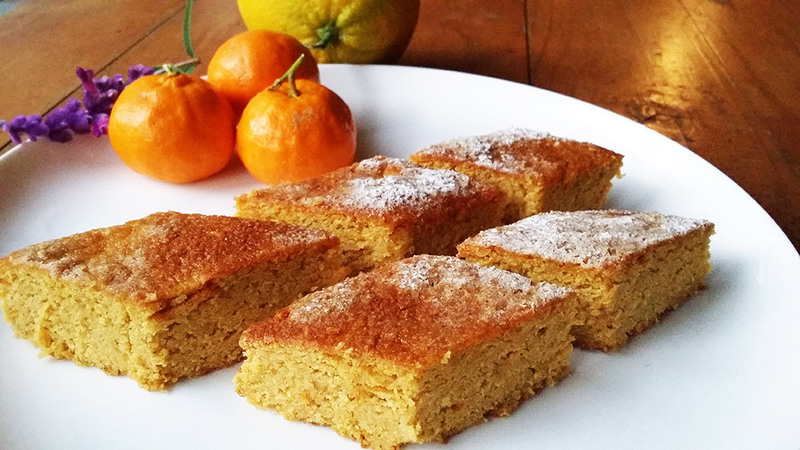 Cut orange cake into wedges or small diamonds for serving. Try to limit servings to small pieces as this cake is very high in roughage! Serve with whipped or double cream or a cup of tea and enjoy!